The medical director of the California Orthopedic Medical Clinic, Inc. is Seyed M. Rezaian, M.D., Ph.D., F.R.C.S., F.I.C.S.. He completed his orthopedic surgery residency training in London, England, under world-renowned orthopedic authorities. He has been a Member of the Royal College of Physicians and the Royal College of Surgeons in London, England, since 1969. He is an active member and fellow of the British Orthopedic Surgeons. He is a fellow of the International Society of Orthopedics and Traumatology (United States Section), a diplomat and fellow in Orthopedic and Spine Surgery of the International College of Surgeons (United States Section), and many other societies. He is licensed to practice in the State of California, Iran, and England, U.K., where he completed his training and residency in orthopedic surgery. He is Board Certified by the American Academy of Neurological and Orthopedic Surgeons, 1984, Board Certified in Spine Surgery by the American Board of Spine Surgery, 1987. Clinical specialties include: orthopedic and spine surgery, management of back pain and back injury, treatment of failed back surgery and correcting complex musculoskeletal inquiries. He is a former university professor of orthopedic surgery with over 20 years experience in the practice of orthopedic medicine and surgery. He has over 100 published papers in the scientific literature, and he has made over 200 presentations of scientific papers at both the national and international level. 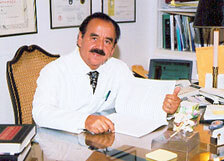 He is an active member of more than 20 scientific societies, which includes the North American Spine Society, California Orthopaedic Association, Los Angeles Medical Association, California Medical Society, American Medical Association, American Back Society, and fellow of the International Society of Traumatic and Orthopedic Surgery. He has been chairman of over 20 national and international scientific meetings. He is an Associate Professor of Orthopedic Surgery at the Western University of Health Sciences.